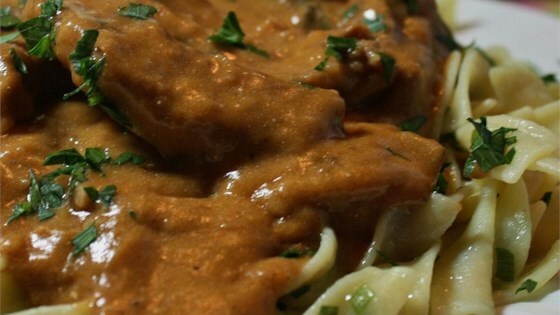 "This is a delicious Stroganoff that my Nana made all the time. My husband's favorite meal is Stroganoff, and before we met he never had homemade Stroganoff sauce. Once my mom made this for him, he has never eaten any other! Serve over rice or egg noodles." Shake 1 tablespoon flour with salt in a large, resealable plastic bag until combined; add beef and shake to coat. Melt 2 tablespoons butter in a skillet over medium-high heat. Brown beef in the hot butter, about 3 minutes per side. Stir mushrooms, onion, and garlic into beef; cook and stir until garlic is fragrant, 3 to 4 minutes. Transfer beef and vegetables to a bowl, leaving drippings in skillet. Melt 2 more tablespoons butter in skillet over medium heat. Cook and stir 3 tablespoons flour in the hot butter until smooth; stir tomato paste into flour mixture. Whisk beef stock into mixture and cook, stirring constantly, until sauce is thickened and bubbling, about 5 minutes. Return beef and vegetables to skillet and stir to coat with sauce. Reduce heat to very low and simmer until beef is tender, 2 to 3 hours. The longer it cooks, the more tender the meat will be. Just before serving, stir sour cream and white wine into beef mixture and heat through. Do not boil. Fantastic! I thought I had beef broth but was out so I used Au Jus. The best Stroganoff I have ever made!